The Annual Veterans In Business Conference provides education, networking and business opportunities for the military community (including all era Veterans, active duty, National Guard, Reservists and military spouses) who continue to strengthen our country with their small business endeavors and entrepreneurial spirit. The conference was created by civic and business leaders in Northern Virginia to provide networking opportunities, training and exposure to the military community who wish to grow their businesses (whether it be B2B, B2G, B2C or non-profit) through the many opportunities the metro DC area affords. 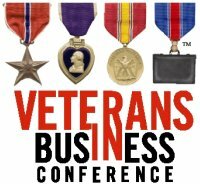 Visit the Veterans in Business Conference website.